Politicians probably dream of people chanting their names; massed crowds on the grand promenades, flags waving high in the spirit of patriotic unity. Dilma Rousseff is probably sick of such dreams. A million people took to the streets of Sao Paulo on a very un-dreamlike Sunday, to rally against her leadership and involvement in the Petrobras scandal. 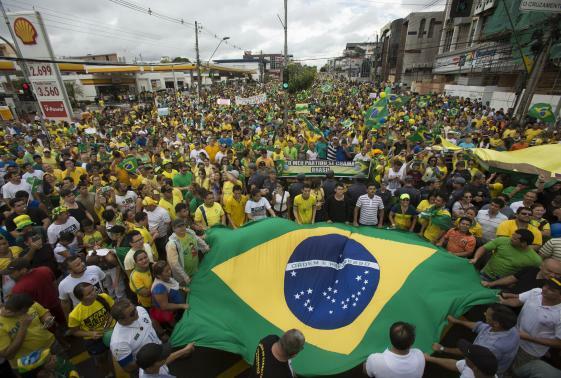 A further 20,000 people took to the streets of Brasilia, with similar numbers also rallying in Rio de Janeiro. The dismal humidity did nothing to quell the protestors’ anger at the incumbent Workers Party (PT) and the President herself. To be sure, the President may very well compartmentalise these rallies as nothing more than a routine exercise in protest that have accompanied her in presidential career. What distinguishes these protests however, is that while they centre on her involvement in a massive money laundering scheme with Petrobras, the protests are much more generally against the PT and Rousseff herself. The rallies are not against public events like the world cup, nor can they be said to have wider global targets, such as the G20. No, these are the beginnings of a very Roussef-centred protest, shifting the tone away from one of balance and conciliation (where arguments about whether the country benefits from a controversial policy are frequently voiced) to one of looking Roussef’s leadership itself, and seeing it for what it is: nepotistic, corrupt and reckless, in other words, completely unsuited to governing the country. The president does seem incapable of staying free from corruption; her leadership has seen the advancement of massively controversial and unfair damming projects, violent reprisals for civic protest and the virtual shutdown of the higher education system across the country for months at a time. Now, with a failing economy, and yet another scandal in the form of the Petrobras affair (in which roughly $3.8bn were skimmed off inflated contracts at the state owned oil company, while Rousseff was president of the board), reveals a record of undoubted corruption, and one which disregards the concerns of a large percentage of the population to benefit an elite few. The economy has been Rouseff’s trump card during her leadership. While she may instigate large-scale change, as long as the country has been a competitor internationally, people have been willing to overlook her errors and foibles. However, the much-vaunted “Brazilian Dream” is beginning to falter, with the economy flagging and the population beginning to suspect that their own dreams may not see fruition. They are not frustrated with Rouseff’s agenda of privatisation; while it may entail social upheaval, people in Brazil have reacted enthusiastically to the creation of jobs and the promised deregulation of industries. What they are tired of is enforced change without debate, violent shutdown of protest and rhetoric promising social mobility while doing everything to benefit only a small elite. It may be that the people of Brazil will have to wait for the next election to get rid of Rousseff – it seems unlikely that she will step down, but unless she addresses change and acts on promises to reform, rallies in the largest cities of Brazil will be less like dreams, and more like recurring nightmares for the President.